Alpha Kappa Alpha Sorority, Incorporated. 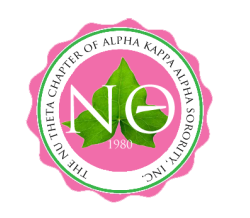 Welcome to the official website of the Nu Theta Chapter of Alpha Kappa Alpha Sorority, Incorporated! On behalf of the Nu Theta Chapter, it is with great joy that I welcome you to our chapter’s website! Over 110 years ago, our founders set out to build a reliable foundation of sisterhood, unity, service, scholarship, and social stature. Continuing the longevity of the legacy laid by our founders, the Nu Theta chapter was chartered on April 19, 1980 on the campus of what was then Grand Valley State College (presently Grand Valley State University). ​The members of the Nu Theta chapter continuously prided themselves on upholding and maintaining the values that the sorority was founded upon, sisterhood, scholarship, and supreme service to all mankind.